Felíz Dia de Acción de Gracias or simply Dia de Agradecimiento this Thursday! Here are two bilingual children’s books that work well reading out loud con familia on Thanksgiving. Even if your familia does not include anyone under 10, I find these books fun and lovely to read during this time—especially if you’re wanting to practice tu Español! 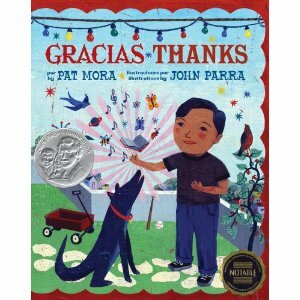 Gracias * Thanks by Pat Mora and illustrated by John Parra. Mora illustrates a little boy’s gratefulness in beautiful poetry. 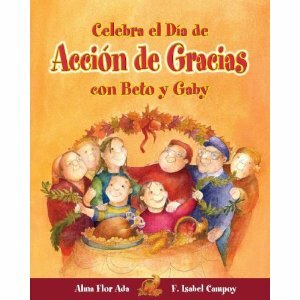 Celebra el Dia de Acción de Gracias con Beto y Gaby by Alma Flor Ada and F. Isabel Campoy. Illustrations by Claudia Rueda. A snowstorm is approaching preventing relatives from coming to Beto y Gaby’s house. The snowstorm, however, brings other unexpected guests: elder friends who are stranded. The celebration becomes a gathering of an alternate familia. This coming week I’m getting together con mi familia and, as always, everyone has a dish to prepare. All of us are watching the carbohydrate (sugar) content in the foods we eat at the same time that we are committed to enjoying delicious dishes. So how do you do that on a day like Thanksgiving? There are many low carbohydrate recipes on-line and there are also a number of low carbohydrate cookbooks offered. Instead of giving you a listing, I’m going to tell you about a few dishes I’ll be bringing to the table. I find that food is much more delicious now on a low carbohydrate diet. I can taste more and I don’t get that heavy feeling after a meal. I remember those Thanksgiving meals that were heavy on carbohydrates/simple sugars and how all of us felt sleepy and lazy and we all complained about gaining weight during the holidays. Not any more! A note on carbohydrates: Carbohydrates are sugars and starches. There are two types of carbohydrates: simple and complex. The simple carbohydrates are refined processed foods like white bread, packaged cereals, soda, corn syrup, etc. Even non-refined foods like carrots and potatoes have a very high content of sugar. Eating one carrot is like eating a spoonful of pure sugar. Foods that are on this list have a low or non-existent nutritional value and cause hunger and weight gain. Complex carbohydrates are foods containing a lot of nutrients and fiber as well. Examples: spinach, broccoli, all the berries (raspberries, strawberries, blueberries, etc. ), cauliflower, asparagus. 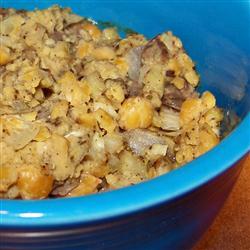 Stuffing: A possible alternative to avoid all that high sugar bread that is in most stuffings is to try Garbanzo Stuffing. Here is the recipe: (CLICK HERE) Check out the reviews of this recipe as well because in the reviews, you’ll find how some people added other ingredients (like zucchini). Mashed Cauliflower: This is so easy and so delicious. I never have that heavy feeling after eating mashed cauliflower as I did with mashed potatoes. Why? The difference in carbohydrate count is key here. 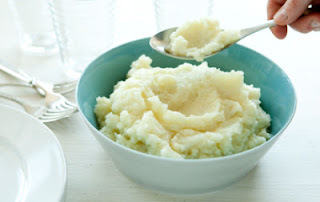 1 cup of mashed potatoes: 41 carbohydrates. 1 cup of mashed cauliflower: 5 carbohydrates (plus a lot more nutrients). 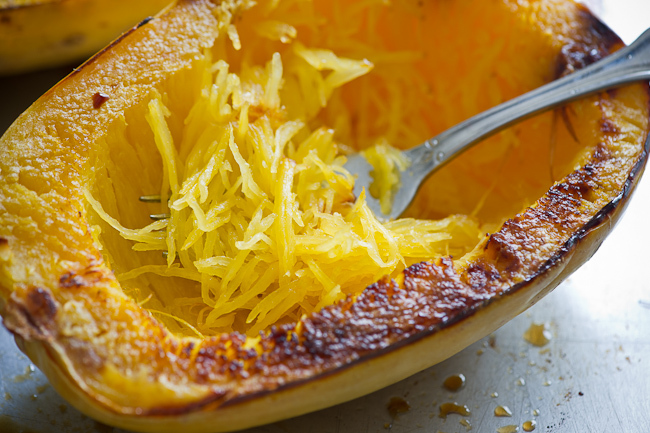 Alternative side dish: Spaghetti Squash makes an excellent side dish for Thanksgiving. 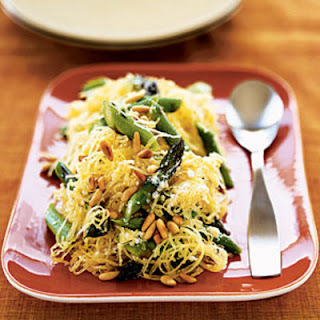 It is also a perfect alternative to the very high sugar/starchy spaghetti. And it’s another “easy to prepare” food. The most difficult part of the process is cutting the squash in half. You’ll need a good sturdy knife and strong hands. Be patient and careful. Once it’s cut in half, scoop out the seeds, etc. from the middle of the halves. 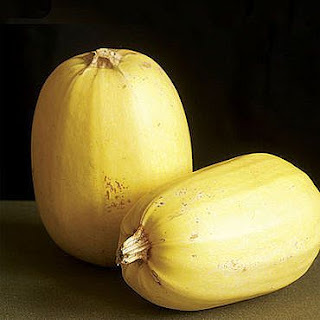 There are various ways to cook the squash (lots of on-line recipes). Keep the cut side up and place both in a baking dish. Rub olive oil on the cut sides and also drip a bit more in the interior sections. Cut up an entire garlic bulb (the cloves in fine slices) and place the slices where you scooped out the seeds. Salt and pepper and add a touch of cumin too. Depending on where you live (altitude and humidity are a factor—I would just keep checking them throughout the cooking process), place in a 275-300 degree oven for 1 to 1 1/2 hours or until you can easily place a fork in the squash. Let sit (covered in foil) for a about a half hour (again depending on where you live this varies). When the squash is ready, scoop it out (it will be so easy) with a fork and it will look exactly like spaghetti. 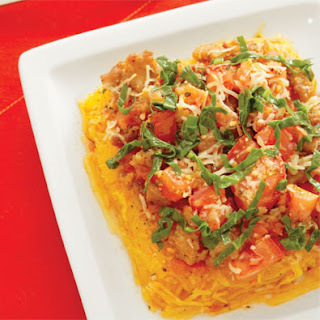 I have mixed the spaghetti squash with homemade pesto, with zucchini, tofu, sausage—so many possibilities here! I hope these three alternative dishes peak your interest enough to try either this Thanksgiving or anytime! Sending you all, Queridas y Queridos La Bloga readers a most health-filled week. 1968: The SAI launches the International Sugar Research Foundation (ISRF) to help it scrutinize the safety of rival sweeteners cyclamate and saccharin. 1971: “Enjoy an ice cream cone shortly before lunch,” beckons an ad in Women’s Day. “Sugar can be the willpower you need to undereat.” The following year, the Federal Trade Commission orders the industry to stop making such claims. 1974: The FDA approves aspartame, marketed as NutraSweet. 1976: The SAI wins the Silver Anvil award for its PR campaign countering growing health concerns about sugar. 1977: Prompted by testimony linking sugar to diabetes, a Senate committee report urges Americans to cut sugar consumption by 40 percent. 1980: 7-Eleven introduces the 32-ounce Big Gulp. 1982: Hershey’s Reese’s Pieces appear in E.T., The Extra-Terrestrial. Sales of the candy reportedly soar 65 percent in a single month. 1989: Monkeys fed enough cyclamate to sweeten 150 cans of soda per week for 17 years are deemed cancer-free. “With cyclamate we made a mistake,” FDA honcho Robert Scheuplein admits to the Washington Post. Early 1990s: Coca-Cola, PepsiCo, and others secure “pouring rights” at universities (and later K-12 schools), giving them exclusive access to vending machines, snack bars, and sports events. 1998: A Georgia kid is suspended for wearing a Pepsi T-shirt to his high school’s “Coke Day” rally. 1999: A record 151 pounds of “caloric sweeteners” is sold in the US per capita—42 pounds more than during the 1950s. 2003: The sugar industry threatens US funding for the World Health Organization [WHO] after a WHO panel suggests that added sugars should account for no more than 10 percent of a person’s diet. 2011: KFC introduces the 64-ounce Mega Jug. For each one sold, the chain donates $1.00 to the Juvenile Diabetes Research Foundation. February 2012: A paper in Nature argues that sugar is physically addictive and linked to diseases associated with metabolic syndrome—including heart disease. May 2012: New York City Mayor Michael Bloomberg proposes a ban on sugary drinks exceeding 16 ounces. Days later, the Center for Consumer Freedom, a group backed by the fast-food industry, buys a full-page in the Sunday New York Times: “New Yorkers need a Mayor, not a Nanny.” In September, the NYC Board of Health votes 8-0 to approve the ban. 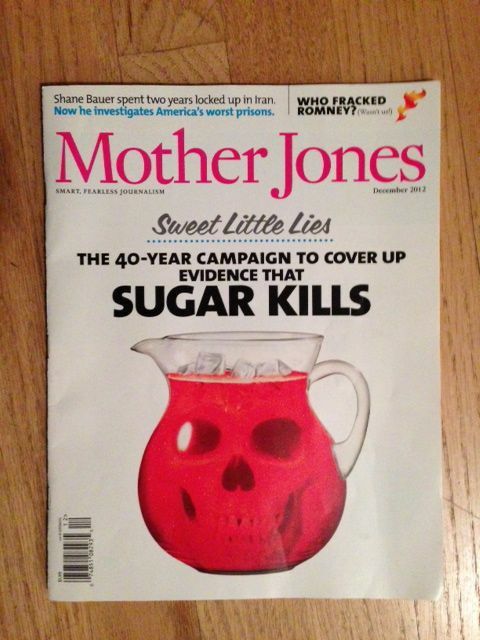 Timeline From: “Sweet Little Lies: The 40-Year Campaign to Cover Up Evidence That Sugar Kills” (Mother Jones, December 2012, pages 35-40 & 68-69). Timeline by Maddie Oatman for this article (pages 38-39).